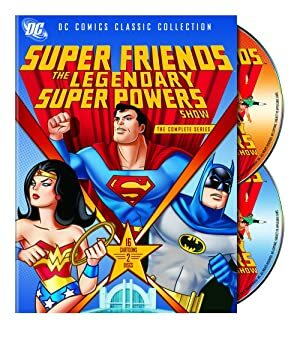 Super-Friends was a goofy cartoon series inspired by DC Comics characters. It had nine seasons from 1973 to 1986. I wouldn’t quite call it “cult”, but it had a notable cultural impact. 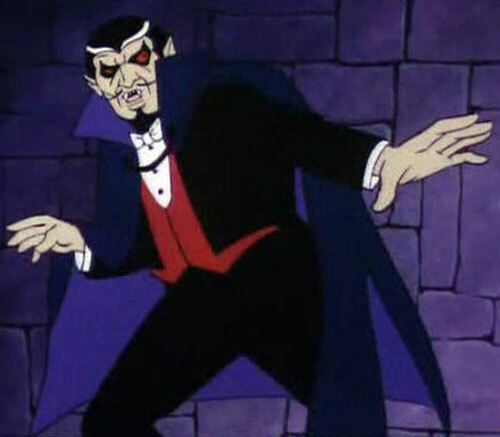 One 1978 episode pitted the Super-Friends against Dracula because heh, why not. Dracula never exhibited any physical prowess in this version. Instead, he enslaved his enemies with his siring vision or his powder. It can be assumed that his is physically above average, but certainly no match for a fully powered Kryptonian . In 1978, Dracula rose from a hundred year sleep. He began a scheme to turn Earth’s entire population into vampires. He started by dropping a bag of siring powder into a passing 747, then used its passengers and crew to continue spreading his vampirism one town at a time. When the airline that owned the jet called the Hall of Justice, Batman & Robin took off to Transylvania. They found a sample of the siring powder aboard. They also saw in the airport radar log that the plane was out of sight for a few seconds in the vicinity of some high mountains. So they headed to those mountans to investigate. Having found Dracula’s castle, Batman & Robin confronted Dracula himself. They deflected his siring beams with their capes, only to be captured with a metallic clamp and lowered into an underground rising lake. Wonder Woman and Aquaman attempted to investigate a ship where Dracula’s drones had struck. But they were almost sired themselves before escaping. After an unnamed official was sired in the midst of informing Superman of the spread of Dracula’s influence to Vienna, Austria, the Man of Steel evaded a few vampire drones. Howbeit, he was turned into a vampire by Dracula himself. He, in turn, began siring victims by the dozen. The Wonder Twins tried covering Superman with ice to snap him back to normal, but only wound up becoming vampires also. By this time Batman managed to free himself and Robin from Dracula’s trap. From there he contacted Wonder Woman and Aquaman and suggested a rendezvous at a Swiss biological research center. The scientists there showed the remaining Super Friends an unusual breed of bat from the Andes mountains that seemed immune to being turned in vampires. They theorized that this immunity may be derived from the atmosphere inside the caves therein. After Batman & Robin returned with a sample of the gas, they tested it on the Wonder Twins and a dozen vampires following them. It worked. Superman then tried to sire Batman & Robin. But not only did his beams have no effect, but they turned the gas on the Man of Tomorrow and reverted him to normal as well. Dracula’s fate wasn’t described any further, but he was never seen again. He was likely exposed the Andes gas and reverted to a normal human as well, after which he could be placed in a Transylvanian prison. Mutation: Limited to bestowing classic vampiric powers, can be undone by a gas found in Andes Mountain caves. Shape Change: Can Only Assume One Specific Form (bat). Control: Only works on successfully mutated victims. Color: Can only turn control victums’ super outfits gray. Invulnerability: Counteracts Physical Damage, Works against aging. Siring Powder [BODY 01, Mutation (ML): 15, HP Cost: 164, Mutation: Same as that of Dracula, Grenade Drawback]. 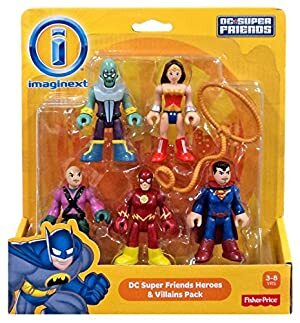 Helper(s): Illustrations from the Super-Friends wiki . 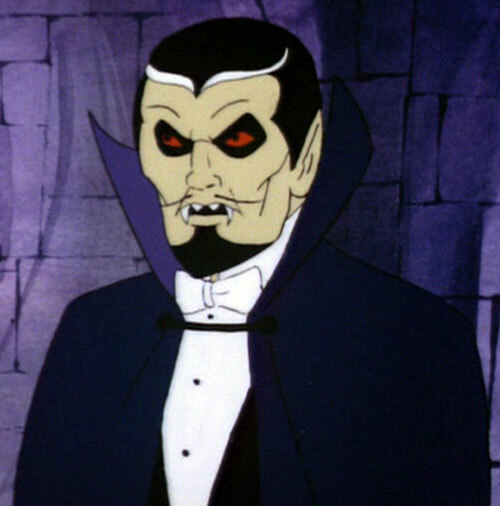 Source of Character: Super Friends (1978 TV Episode: Attack of the Vampire).